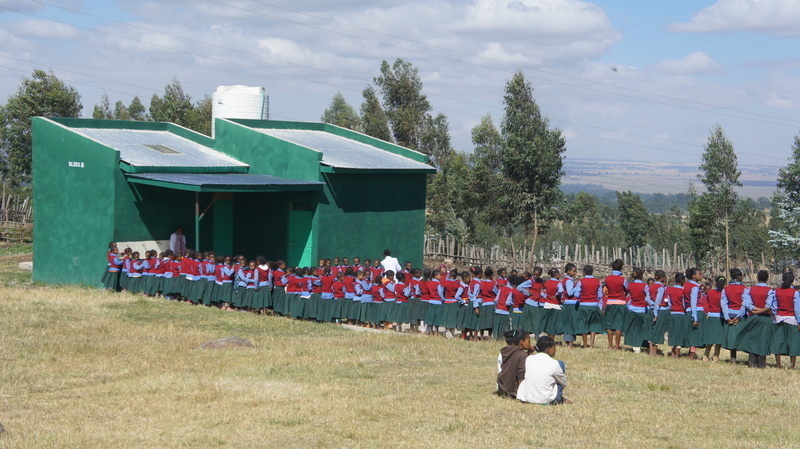 For a number of months we have been building a toilet and shower block at the Bethany School in Bekoji, Ethiopia to improve the hygiene of our students and their overall health and well-being. The block was completed in December and attracted a crowd of spectators for it’s opening ceremony. David Spurdle our Director arrived in Bekoji at the start of December and had the privilege of being present at the official opening of the new toilet and shower block for all of the boys and girls. David and a special guest were joined by a crowd of over 1000 people, including all the Bethany school students and many local people. Everyone wanted to have a look inside the new toilets which are a rare commodity in the poor town of Bekoji. Of all the children in Bekoji, not one of them has running water in their family homes so keeping clean is a very difficult task. You can therefore imagine the great joy and excitement when this new block was opened and the children were able to take a shower, some for the first time! As taking a shower is a new experience for all of the children we have employed two members of staff to help them learn how to wash and learn all about cleanliness and hygiene. Each child is now able to take a weekly shower which has greatly improved the health and hygiene of the children and helped bring dignity and joy, especially to the older girls. Read more about our work in Bekoji here.